An especially delicious treat for a cold night – homemade chocolate milk with dark chocolate served with soft whipped cream and roasted marshmallows. Yields 2 small cups or 1 large cup. Break the chocolate into squares and put in a pot. Add milk and sugar and cook together on low heat until all the chocolate melts and a smooth chocolate milk is obtained. If you want a really thick chocolate milk, continue cooking for another four to five minutes after boiling (keep mixing the whole time, so that the chocolate does not burn). Pour the chocolate milk into the cups (fill up to two-thirds of the cup). In a bowl, whip cream and powdered sugar into a firm whipped cream. Using a spoon, place mounds of whipped cream on top of the hot chocolate. Insert three to four mini-marshmallows on each skewer and grill gently (!) on an open flame or using a broiler. Decorate with grated chocolate. 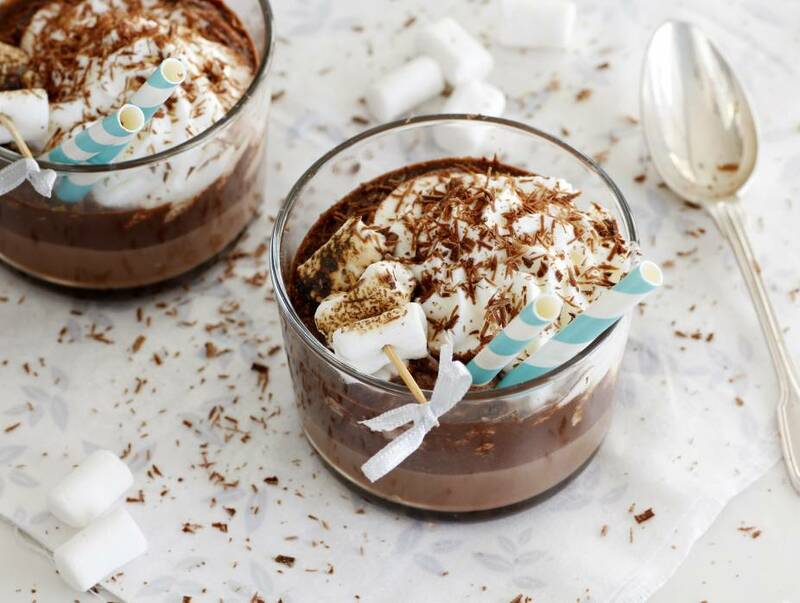 Serve the hot chocolate immediately with the roasted marshmallow skewers. If you wish to make the hot chocolate "for adults only," add a little liquor to each cup. You can use milk chocolate instead of dark chocolate, but reduce the amount of sugar in this case so that it will not be too sweet.